Tonight thousands of writers around the world will bend over their notebooks and keyboards and begin the insane task of writing a novel in a month. I have been participating in Nanowrimo off and on since 2007. This year will be the third attempt I make at writing what has now become Shadow of the Panther, but this time I am prepared. I am armed with my trusty snowflake, bolstered by the positive reviews I’ve received from SotO (Shadow of the Owl for the laymen), and motivated by the knowledge that this is my job now. Right now it’s not paying anything, but blogging barely paid anything, and was both a money and a time sink in the last years of GameGeex when I no longer cared about what I was writing. Now I care a great deal, and hopefully I will be able to get others to care just as much as I do. I had a slow start this morning, and I’m not sitting down to my planning until noon, but I have a little under twelve hours to get as much preparation done as I can. I am also trying something new this year: I am going to finish my planning while I start writing the first scenes. The last time I attempted to do my complete planning in the first two weeks of November, and write the book in the last two weeks, and it just wasn’t enough time. I was happy with the planning I did (it ended up being the push I needed to get Shadow of the Owl finished), but I need to maximize the hours I have in the day. The other new thing I’m trying is sticking to a writing schedule. I will be writing in the morning each day, and only writing the amount I need to reach the word count goal or finish a scene, whichever comes first. I have a tendency to burn out on these sorts of things, so I am looking to try moderation in this current venture. I have given myself three months to write this book, so I have plenty of time. I want to write words that inspire me, and I can’t do that just plowing through to fill space. The more time I take planning, and then subsequently crafting my scenes, the less editing I will have to do at the end of this. So that’s me: a cray loon trying to write her second novel for the third time. If you’re a Nano’er like I am, feel free to friend me and we can plow through this craziness together. I don’t want to be a writer. I want to write. Telling stories is both what I seem to do best and what I most enjoy doing. As a graphic designer and brand specialist I’m always looking for the narrative in whatever project I’m working on. I’ve always gravitated towards hobbies with a strong storytelling element to them; improvisation, role playing games, etc. Even my preferences in visual arts lean in the direction of pieces that want to tell a story. It’s strange that it took me until so late in life to discover how much I adore writing. Especially long form narratives like novels and series. I’ve written several books but only two so far have been deserving of being published. The Life Engineered, (winner of the Sword &amp; Laser Collection contest) and A God in the Shed. I have a lot of other ideas I want to bring to life and hopefully I’ll get the opportunity. I dream of one day having the privilege to write for a living, concentrating on typing new worlds into being. 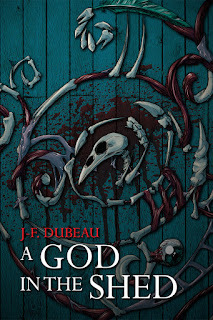 I hope you’ll be a part of that by supporting me and pre-ordering A God in the Shed. Doesn’t matter to me. I tend to prefer the practicality of an ebook but the aesthetics and texture of a real book. I work a lot in printing as a designer so I have a certain affection for the printed mediums. Clive Barker’s Galilee. There’s something beautifully bittersweet about that book. I don’t! I think that absorbing information, stories and narratives are important but I don’t think the chosen method is important. Of course I favour books because I love reading, but as the advent of audio book has taught me, the important part is the content. I’m tempted to say Galilee but that’s not a good recommendation. It speaks to me but might not do as well for others. I’d say if you haven’t read The Adventures of Huckleberry Finn then that is a definitive must. NaNoWriMo. Or rather, I’ve always wanted to write a book. NaNoWriMo seemed like a good way to get that off my bucket list. Midway through it though I discovered that this ‘writing’ thing was an addiction I wouldn’t be able to shake. Becoming a writer is just a means to writing more. Pleasure. The euphoric joy of having a story be told by characters of my own making. A horrible, boring and unreadable vampire novel. I like Clive Barker’s cadence and style but I love David Brin’s inventive optimism about the future. A little from column A and a little from column B. I like to plan my course of action before I start writing but once I get into the motion of writing, I tend not to stop until I’m done, even if it means making mistakes I’ll have to fix later. Answers to an interview. Seriously though, I’m finishing the first draft of the sequel to The Life Engineered. So it’s science fiction. I like the challenge of writing something plausible in the frame of the demands of scientific reality while also being able to explore various versions of the future. I don’t know. I’m always terrified that I’m stealing ideas. Usually I find something in someone else’s narrative that I want to either explore in more depth or think should have gone differently and iterate until it becomes what I hope is my own thing. I’m not going to break any ground by saying this but just write. Don’t overthink or over plan. Just write and put it out there. You’ll never get better if you don’t write and have your writing critiqued by others. If it’s white page syndrome, just write. Forget quality or even common sense, just dirty your page with words. If you’re stuck on a plot point, move to another section of your book and come back to it later. Don’t try to force the plot. Your readers will notice. ‘A God in the Shed’ is special because it’s a juggling trick of contrasts. I only came to realize this recently while re-reading some portions but in a macro sense, it’s a story about the places where extremes circle back onto themselves. Where extreme beauty becomes ugly, the worst of horrors become magnificent and the most unbelievable magics fall into the natural order of things. I have a few protagonists but let’s talk about Venus McKenzy who is central for the first portion of the book. I like her because she’s a dumb teenager but smart enough to recognize when she’s making mistakes. She’s not an adult in a tween’s body. Also, unlike the current trends for female characters, she’s not a strong woman because she’s violent or angry or a fighter. She’s whip-smart, clever but human, which is important if I want her to react realistically to the horrors she faces. I hate her because she’s significantly smarter than I am and that’s difficult to write for. I have no idea. One of those Fanning kids if there’s still one of the appropriate age. Unnaturally talented those kids are. The book is planned as a trilogy. Hopefully a real trilogy and I won’t get carried away and write seven book. I like my tales to have endings. Though I’m not averse to telling a different story in the same universe. If there’s one thing I want to add it would be that I don’t want to be a writer. I just want to write. I never realized how important it was to encourage creatives until I was the one with an addiction to feed. People underestimate the impact they have with so small a gesture as just pre-ordering a book on Inkshares or commenting on a part of a book they liked. Being part of a creative’s journey to being able to do what they love, what they need to be doing, is huge to the creative, no matter how tiny it might be to the supporter. Find something you like from someone trying to break in their industry and support the hell out of it. wouldn’t take a single one back. those days, what we couldn’t grow, we’d just make ourselves. is summer to a child like I was that day. My friend Jonathan and I had gone deep into the forest. catching. Children playing childish games. touched you, you were caught. bread that we called rations. if he were glad to see me. the sun, a look of serene pleasure writ upon his face. simply shrug off, but cheating isn’t one of those things. we were unhappy with him. children do without knowing the reach of consequences. thought as to our companion’s strange abilities and powers. assault on our young minds. holding him to the ground and had bitten his pinky clean off. getting off my wounded friend who scampered away. “He cheated. off the strange creature we’d met and befriended in those woods. for another twelve years, by then, things had changed. I have always been fascinated with the story of how a person got to be where they are. Over the weeks working with other writers in the Inkshares Nerdist contest I realized I had a unique opportunity to pick their brains about reading, about writing, and about their novels. To that end, I’m starting an interview series where I take the time to sit down and pick the brain of other authors who are out there writing amazing stories of their own. 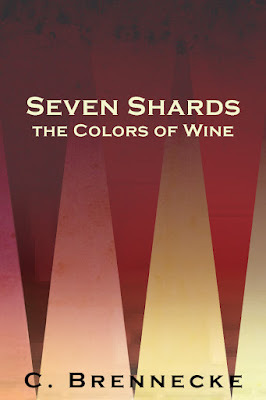 First up, I’d liked to introduce C. Brennecke, author of Seven Shards: The Colors of Wine currently funding on Inkshares. Tensions run high across the Kingdom’s seven counties, as allegiances are tested and old wounds become inflamed. The recent time of peace nears its end when the Shadow King flexes his power and the oppressed lash out. His actions stir up new leaders and visionaries from the generation now coming of age. With so many changes in the air, any of the Kingdom’s residents could bring about the tipping point; from the disillusioned artist as she grows in fame, to the cocksure fool pursuing love for the first time. Far from the sights of the King’s throne, hidden away in a cave, a High Priestess sits and studies the threads of fate as they weave the lives of her fellow citizens towards an inevitable war. Fueled to urgency by a dire prophecy, she stretches her influence far and wide, carefully building her allies up while breaking her enemies down. As she manifests her will through schemes and lies, those closest to her begin to doubt the sanctity of her vision as its costs pile up. Could her well-intentioned interference cause more harm than good? I have so many questions about the story after reading just that one sentence! Just wait until you read the rest of what she’s shared with you. Anyway, onto the interview proper. I think you forgot the “s” in “books!” My current top three are The Night Circus, The Mists of Avalon, and Red Azalea. Reading develops your imagination and your understanding of the world. The ways in which you can learn and become a better person through reading are innumerable. I’m not sure that’s my goal; at least it wasn’t until very recently. I simply want to capture my stories and share them with others. I write because if I didn’t, the stories would fade away just like a dream. I could interpret and answer this question in many ways, but I think I’ll go with the most embarrassing. The first book I wrote (not to completion, mind you) was a tale of a widowed woman rekindling the flames of her long lost love, who happened to be a vampire. Both. I’m constantly going back and forth between both modalities. Fantasy is a genre I’m fond of and familiar with as a reader, and it allows me to be creative and inventive without having to reinvent every single thing. This is difficult to answer because I’m a very intuitive, inspiration-based writer. Some of it comes from people or situations I’ve observed, some of it comes from backstories I’ve written for RPGs, some of it comes from prompts or feedback I’ve received, and most of it comes from an unknown source. Jump in and start writing. Save every note, every idea. Don’t expect it to be cohesive right away. Do expect that it will take many, many long hours. Taking a walk usually helps. So does switching from keyboard to pencil, or vice versa. If you don’t have the idea you want, write anyway. Just write something. My story tackles a lot of contemporary issues and intrinsically human experiences without belaboring any one point. It is diverse without being about diversity. Some of the characters fall into familiar stereotypes, while others defy them. But every character is layered and achieves growth throughout their journey. I have a few protagonists, but the one that bookends the story is the High Priestess. I love her physical quirks and her almost self-sacrificial devotion to a higher purpose. In pursuit of that purpose she can be very manipulative and deceitful, which can be a hard thing to forgive. But ultimately, her judgment is right. I think she will be a very divisive character. Cate Blanchet would be my first choice. Michelle Williams could pull it off as well. I wasn’t originally, but lately I’ve been changing my mind about that. So, what I mean to say is yes. 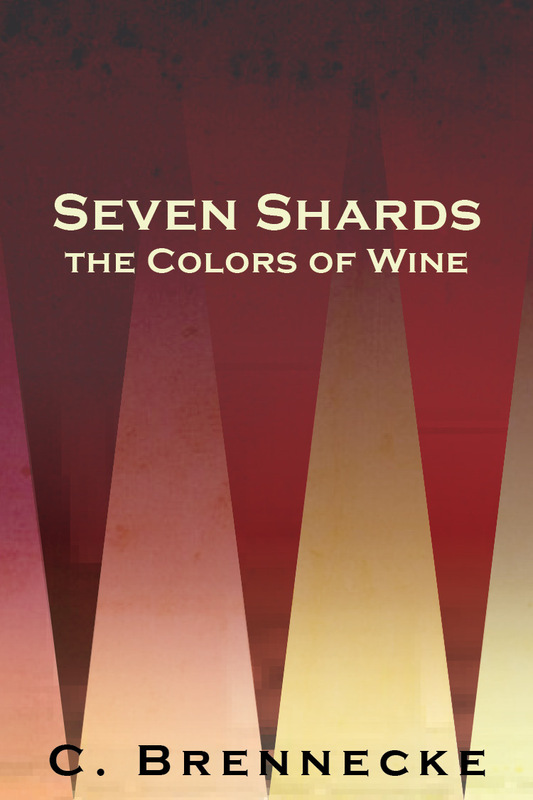 Seven Shards: The Colors of Wine is a fantasy that will resonate with the common reader, not just fantasy fans. Everyone will find a relatable character or storyline within its web. It will also challenge many people to question or stretch their sense of morality. Thanks so much C. Brennecke for being my inaugural interviewee! As promised, here is an excerpt from her novel. If you love what you read here, why not preorder the book and help it get published? The High Priestess turned to the timid Lygar with a scrutinous eye. “You’re not a natural fit for Archon, are you?” The priestess surveyed his face. Alphonse nodded slowly, not offended, or even surprised, but more than a little unsettled by the frank analysis. Though she had said few words, the truth of her statements weighed heavy in his mind. The title of Archon had fallen to him solely because he happened to be the eldest able-bodied male survivor of the last two wars. And just as some whispered, his survival was attributed not to bravery, but to mere cowardice and luck. In any other time, he would have been challenged, and presumably killed, for the title. But this generation could not afford to lose anyone else, not even a weakling like him. Aside from himself, all that was left of the Lygars was a handful of old women and a few dozen young adults and children. They were no more than fifty by his last count. Alphonse sat rigid, silently growing more anxious. The ever-real possibility that he was not even leader enough to assure his people’s immediate survival gnawed on his mind. He was a coward and he knew it. And how could a coward protect his people? He could not fight, his resolve was tenuous, and the charisma to inspire others was not a gift that he possessed. Even trivial matters, such as lover’s quarrels, made him feel uneasy. The first few years of his reign had past by easily due to the fact that the majority of his people were mere children. But now that those children were entering adulthood, the demands of leadership were quickly becoming more difficult to fulfill. The color drained from the Priestess’ face and her eyes began to glaze over. As if on cue, her guardian appeared with a cushion and guided her safely down to the floor. She lay there for a moment, still as a marble statue. Her breath grew louder and louder until she, quite abruptly, sat up. I am happy to say that today I am starting a new blog, focusing on my current passion: fantasy writing. I envision this as a welcoming place where writers can talk about their craft. It gives me a safe space to noodle through some of the concepts I have been toying with, and to share what has been working (and what hasn’t worked) with other writers. Hopeful this journey will be helpful to others. I know it will be helpful to me. Tomorrow I will put up the first entry in my series interviewing other authors. Thereafter I will dive headfirst into the world of fantasy writing, starting with how I plan my novels. It’s perfect as I have begun planning a new project. You can find out more about who I am here, and what I write here. Until tomorrow!